Hunstanton is home to one of the most significant buildings in England. 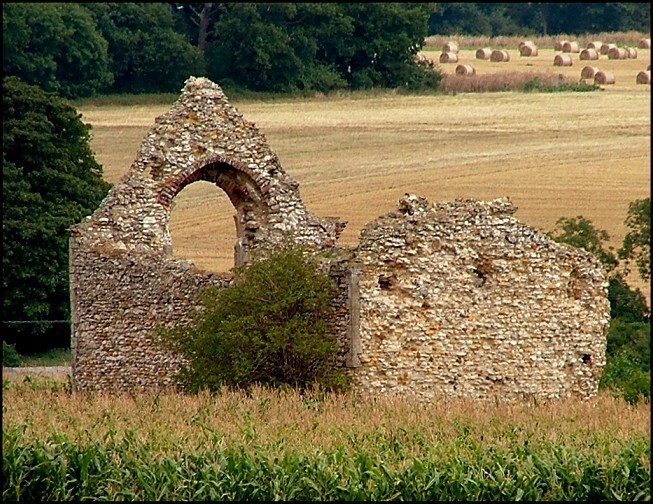 It sits across the field from this pretty ruin, the one visible from the other, and could not be more different. It is Smithdon High School, designed in 1949 by Alison and Peter Smithson as the first major Modernist building in the Brutalist style in western Europe. Generations of architectural students have come here to see where it all began. Brutalism, as a genre, has been ill-served by commentators on the history of architecture - the name, for a start, which comes from the French word meaning 'raw' or 'dry' rather than anything to do with brutality or beastliness. Early photographs show it looking magnificent in the fields - the rural location must have suited it even more then than it does today - but over the half century since it has been crudely modified as only a vast flat-roofed glass box designed for a low price fuel economy can be. There was never any danger that a building designed in 1949 might take its cue from a medieval ruin across the field. Nowadays, we'd be trying to tie the two together to create some kind of neo-medieval shopping complex, I suppose. The Smithsons have since renounced brutalism, and it is easy to see why, but their building was a symptom of the most powerful post-war optimism. It really was intended to make the world a better place. We could not know then what some of the appalling consequences would turn out to be. I wonder what these two buildings think now as they look out across the fields at each other. The school, sulking beneath its 1980s application of black sandwich wall panels and Thatcherite mock-Georgian wooden window frames, sees a simple, one-cell church which probably dates from the 13th century judging by that huge red-brick outlined archway in the eastern wall. I assume that it was an east window, but could not get close enough to rule out the possibility that it was a chancel arch. St Andrew is surrounded by a circular crop of maize, which makes it rather appear as if it has been transported by a flying saucer from a hillside in the Dordogne. 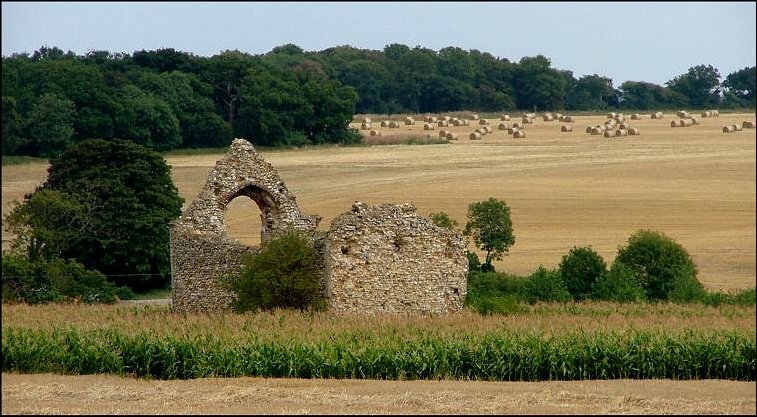 It is very attractive, and easily seen from the Hunstanton bypass. A slip of a bureaucrat's pen puts it into Ringstead civil parish rather than Hunstanton, which is where you will find it in Pevsner.